For those born February 9, 1964. 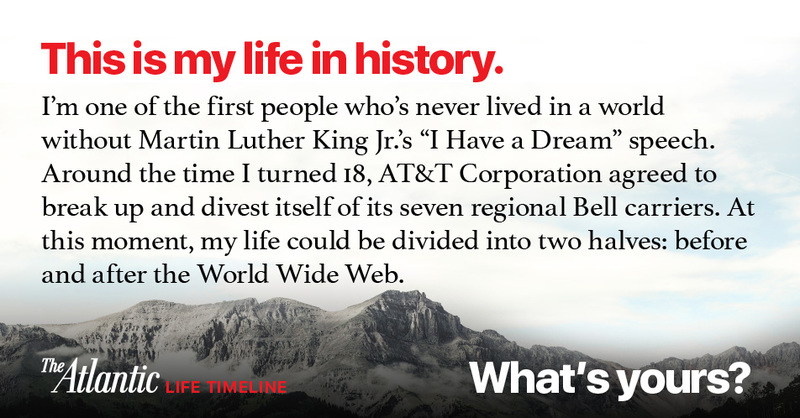 You're one of the first people who's never lived in a world without Martin Luther King Jr.'s "I Have a Dream" speech. In January 2016, Melinda D. Anderson explored the ways students learn about Martin Luther King Jr. and social justice. Around the time you were born, the G.I. Joe toy made its debut. In December 2015, Nolen Gertz wrote about how action figures help form the identities of adults. You were born in February of 1964. This year, The Atlantic celebrates its 160th birthday, making it 3 times as old as you. The year you were born, Edward Weeks, then editor of The Atlantic, endorsed a candidate for the United States presidency for only the second time in the magazine's long history, supporting then-incumbent President Lyndon B. Johnson over Senator Barry Goldwater. At 5 years old, you were alive to behold people walking on the moon. Saturday Night Fever was released in 1977. Around your 18th birthday, AT&T Corporation agreed to break up and divest itself of its seven regional Bell carriers. In the January/February 2013 issue, Justin Fox wrote about the possible emergence and implications of web monopolies. Your life can be divided into two halves: before and after the World Wide Web. In October 2015, Adrienne LaFrance wrote about the disappearance of published content—including a Pulitzer finalist's 34-part investigative series—from the internet. When you turned 43, you watched humankind reach the outer solar system. In 2009, Michelle Obama, who was born the same year as you, became the first African American first lady of the United States. In November 2015, Michelle Obama wrote about addressing the global crisis in girls' education by challenging cultural beliefs and practices. By the time you turn 60, the World Bank predicts that the U.S. dollar will lose its global dominance. In February 2012, Charles A. Kupchan wrote about the world's emerging economies, and how the world will look by 2050.